Polaris Prize shortlisters PUP pop at HPX. "My body has no clue what time zone it's in," says Stefan Babcock, on the line Thanksgiving morning, the day after he arrived home in Toronto from a surprisingly successful tour of Australia. PUP, the punk band he leads, caught Canada's ears quickly with its May release The Dream is Over—it was shortlisted for the Polaris Prize; the band, perpetually on the road, sent its parents to the gala—but the quartet had no idea what awaited on the bottom side of the globe. "We flew across the world expecting to play to 15 to 20 people a night, and we sold out every show, 600-cap rooms," says Babcock, who screams his songs with reckless abandon but is focused and thoughtful in person. "Every other experience of building a fanbase has been organic—five people on one tour to 20 people the next tour to 80 people the next tour. In the rest of the world there haven't been any huge surprises, it's just been hard work." He attributes PUP's Aussie success to play on the country's radio station Triple J: "That's the only place in the world we have a commercial radio song." 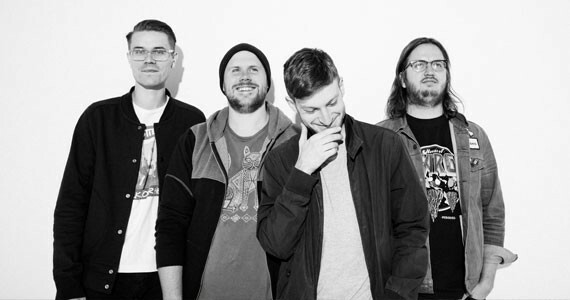 PUP's songs are frenetic and loud, with a live show to match, including shout-along parts, melodic guitar lines and a fair amount of lightheartedness (The Dream's opening song is entitled "If This Tour Doesn't Kill You, I Will"). But this is a serious band—its four members quit their jobs years ago to focus on it full-time and have since clocked up to and over 200 shows annually. "Right now we're in the middle of a three-and-a-half month tour," says Babcock. "It's 100 days long, and that's a long time to be on the road. But we've always been road dogs—as long as we've been able to get shows, we've played as many shows as our bodies are capable of. For a band—at least outside of Australia—that's never gonna have a big radio hit or, you know, songs in car commercials, it's important to be on the road." This week's Pop Explosion marks just the second time PUP has played Halifax. The first was HPX 2013, opening for Fucked Up. "We had just done this cover of a Fucked Up song for Now magazine," says Babcock. "After we played, Damian [Abraham] was like, 'That was a great set, do you guys wanna play the cover with us?' It was 'Queen of Hearts.' Vish Khanna did the intro and said, 'There's no other band like this one, and here they are,' and Damian made us walk out on stage and play that song. It was a memorable experience."